Be the first to share your favorite memory, photo or story of Lanies. This memorial page is dedicated for family, friends and future generations to celebrate the life of their loved one. 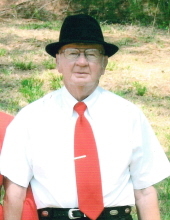 Mr. Lanies Lowe Hamby, age 92 of Lenoir, passed away Sunday, February 03, 2019 at his home. Funeral services will be held 2:00 PM, Wednesday, February 6, 2019 at Green Mountain Baptist Church with Pastor Junior Hamby and Pastor Lane Hamby officiating. The body will be placed in the church at 1:00. Burial will be in the church cemetery. The family will receive friends from 6:00 until 8:00 Tuesday evening at Reins Sturdivant Funeral Home in North Wilkesboro. Mr. Hamby was born November 3rd, 1926 in Wilkes County to Andrew and Laura Greene Hamby. He was retired from Broyhill Furniture and was a member of Green Mountain Baptist Church in Lenoir. In addition to his parents, Mr. Hamby was preceded in death by a sister: Pearl Miles and eight brothers; Jack, Sherman, Russell, Caney, Barney, Stanley, Jake and Linney Hamby. He is survived by his wife of 70 years; Beulah Greene Hamby of the home, two daughters; Lois Pipes and husband Fred and Geneva Triplett of Lenoir, two sons; Dwight Hamby and wife Patsy and Steve Hamby both of Lenoir, six grandchildren; Rena Pipes, Tony Pipes, Terry Hawkins, Scott Hawkins, Junior Hamby and wife Sherry and Holly Hendrix and husband Danny all of Lenoir, eight great grandchildren and seven great- great grandchildren. Flowers will be accepted or memorials may be made to Wake Forest Baptist Care at Home Hospice 126 Executive Drive Suite 110 Wilkesboro, NC 28697 or Green Mountain Baptist Church 2077 Piney Grove Circle, Lenoir, NC 28645. To send flowers or a remembrance gift to the family of Lanies Lowe Hamby, please visit our Tribute Store. "Email Address" would like to share the life celebration of Lanies Lowe Hamby. Click on the "link" to go to share a favorite memory or leave a condolence message for the family.